Lose It! 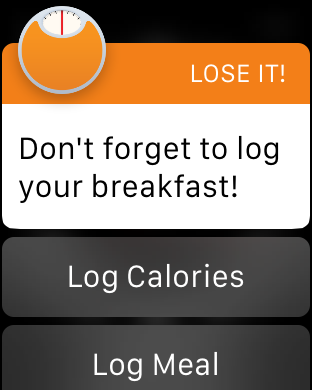 uses the Apple Watch notification feature to remind you when youve forgotten to track a meal. Better yet, if you dont have time to log each and every item in detail, you can quickly and easily log just calories directly from the watch. Of course, if now is a good time, you can just tap the log now button on your watch and Lose It! on your phone will open to just the right spot, making it quick and easy to track that breakfast. Join the millions of people who have lost weight using Lose It!. As the most successful comprehensive weight loss program, Lose It! makes it easy to choose how you want to lose weight. We give you all the tools you need to track food and exercise, plan meals, and stay motivated to make smarter choices and achieve your goal. Lose It! is weight loss that fits. Getting started with Lose It! is easy. Simply download the app, tell us a little about yourself (or import your profile from the Health app) and we'll create a custom weight loss plan for you. Then start logging your food and exercise. There's no easier diet app! -Foods logged to your phone's Health data will automatically sync to Lose It! Want to know where your calories are coming from? Need help breaking through a plateau? Our newest feature Insights helps you answer questions like these to keep you on the road to success. Lose It! makes tracking a snap. Our platform integrates with the best health and fitness devices, trackers, and apps available (wireless scales, pedometers, workout apps, and more) to provide a truly seamless, connected experience. We think health & fitness is more fun with others. Lose It!s challenge platform unlocks your competitive side and helps you achieve your goals. Whether its weight loss, exercise, or total wellness, Lose It! offers head-to-head, team, and group-based challenges. Compete with each other or work together toward a common goal. Join a public challenge or create your own! Join Lose It! today for free, or upgrade to our premium version to unlock even more features than our calorie calculator! Like us on Facebook: http://www.facebook.com/loseit or follow us on Twitter: @loseit. Lose It! for Apple Watch enables members to monitor daily calorie intake at a glance. As members log food and exercise throughout the day, they can instantly view their calorie budgets, and use that information to make smarter food choiceslike swapping out that chocolate chip cookie for an apple. For those interested in a more detailed look at their daily, and even weekly, nutritional breakdowns, members can simply tap their calories-at-a-glance screen and pull up more detailed insights. Forgot to log a meal? No problem. Lose It! taps into Apple Watchs notification system, and can remind members when theyve forgotten to log. Sometimes, this little nudge is all they need to stay on track. Finally, Lose It! for Apple Watch makes logging quicker than ever with the addition of an entirely new feature: one-click calorie logging. If members dont have time to log each item of a meal in detail, they can easily just log calories directly into the watch. Since 2008, Lose It! (www.loseit.com) has helped more than 24 million members shed more than 40 million pounds by delivering the most comprehensive, personal app-based weight-loss program. Continuing to lead the Health & Fitness and Top-Grossing App categories on iTunes, Lose It! empowers members to live healthier lives and achieve their weight loss goals through motivation and challenges, coaching, overall health management, and the insights that come from tracking and monitoring daily calories, exercise, and nutrition. Lose It! makes it easy and convenient for anyone to transform their lives in meaningful, healthy ways on the go and at the touch of a screen. Based in Boston, Lose It! is powered by proven nutrition science, robust behavioral data, and customer-centered software development and continues to lead and innovate the digital health and fitness market. Join the millions of members experiencing weight loss that fits by visiting LoseIt.com or downloading the Lose It! app for iPhone or Android.